Our team at goPhysio are experts in the assessment, diagnosis and treatment of your injury. They are delighted to be offering Shockwave Therapy as part of your injury management, to help you get back doing what you love. In addition to your Shockwave treatment, your sessions will also include education, advice and an appropriate post treatment plan from our experienced team, to further support your recovery. Hugo is part of our Physiotherapy and Shockwave team. He graduated as a physiotherapist in Portugal in 2013 and worked in private practice for 3 years before deciding to come to the UK, to work in the NHS initially. Hugo joined the goPhysio team in 2017. He´s an experienced manual therapist specialised in musculoskeletal conditions, with qualifications in Acupuncture, Myofascial techniques and Pilates. Hugo has a special interest and expertise in managing running related injuries. In his spare time Hugo likes to go to the gym, play guitar and travel around. He is also on a mission to find the finest Portuguese custard tart in the UK! Kim is part of our Physiotherapy and Shockwave team. Her positive and encouraging nature helps get the best out of everyone. Kim is goPhysio's Clinical Lead, taking a key role in supporting and developing our team and services. Kim graduated in 2010, from Coventry University - since then, she's completed APPI Pilates class instructor training to level 3 and qualified in using Acupuncture, both of which are really useful in her work here at goPhysio! Kim is excited to be using Shockwave Therapy to help our patients further. Outside of work, she loves spending time in the garden and cheering on her other half from the side of a rugby pitch! Chris graduated from Coventry University in 2008. After having worked in a ski resort clinic and a hospital in British Columbia, Canada, he moved backed to the UK and worked in private hospitals in Reading Berkshire. During this time, he also spent 6 seasons working part time with Reading FC academy. He then went on to spend 2 seasons with British Parasnowsport, working with elite athletes with varying disabilities. He also volunteered at the Glasgow Commonwealth Games covering Rugby 7’s. 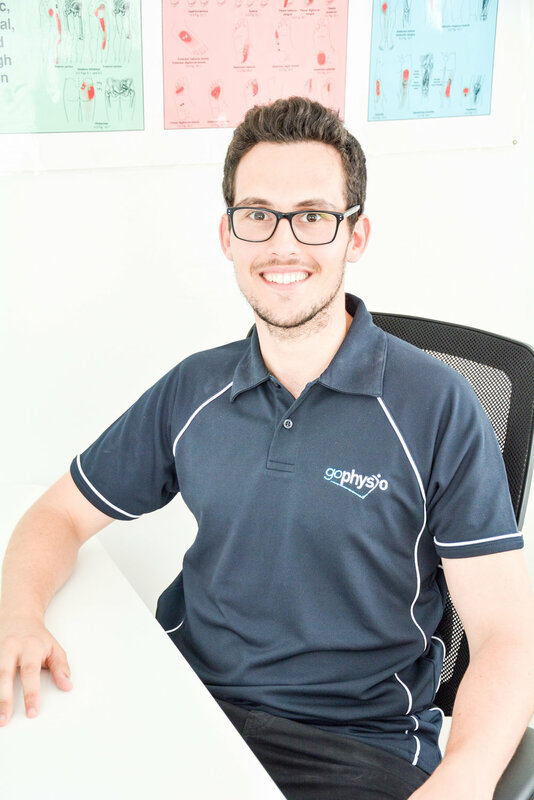 Now Chris has a keen interest in all musculoskeletal issues especially in chronic pain and sports injuries. Chris is also a level 2 APPI Pilates Instructor. Outside of work he enjoys running, gym, indoor climbing and more recently is trying to learn to play golf! Roz joins the goPhysio team with over 20 years experience working as a Physiotherapist. Roz has worked in high level sports, including with the GB rowing team, British Gymnastics and English Institute of Sport swimming and diving teams as well as in the NHS and private practice. Roz is a level 2 APPI qualified Pilates Instructor.